The doubts as to whether the first egg might be laid on 19th or 20th were resolved in the middle of the night between the two dates, the egg first noticed by keen webcam watchers at 00:25. We’ll count that as March 20th! And just about visible when daylight came. That laying pattern for the first egg shows remarkable consistency over the last four years and has coincided with first eggs appearing in several other urban nest platforms in the UK, though others are still waiting. The egg soon disappeared behind the edge of the box after brooding and remained out of sight through to dusk, as below. Could that light on top of the crane be the UFO that made the news from the webcam in December?? By the end of today (Tuesday 21st), there appears to be just the one egg still. Following a heavy hail/ snow shower late this morning here in Sheffield, and temperatures dropping down to a couple of degrees celsius, the egg is being brooded overnight from the look of things. The eggs are very resilient and we can expect to see them being left uncovered for long periods of time until the clutch is (almost) complete, after which they’ll be brooded intensively for around 32 days before hatching is due. So no need for concern if they are apparently unattended for hours on end: in reality one or other of the adults (or both) will be close at hand, even if they’re not visible on the webcams. In past years, it’s taken the St George’s pair a week to lay their full clutch, with around 48 hours between eggs on average. Will we wake up to a second egg in the nest? In each previous year, the St George’s pair has laid four eggs and we can expect the same this year if all goes well, and the female is indeed the same as in previous years. And do please keep the donations coming. We’ve almost reached our first milestone with the fundraising, a great step towards funding the materials that will enable DNA research on these wonderful birds and also prove whether we’ve had a change of female. I’ll now be away for 10 days with work, so no updates on the blog until the start of April. Enjoy developments in the meantime and I hope to come back to a clutch of four eggs, or maybe more! Firstly, a huge thank you to everyone who has donated to the Peregrines Project over the last few weeks. It’s been moving to see so many words of support from near and far, and from all ages. The donations will enable us to do more with the project, especially in terms of drawing on the St George’s birds to extend our knowledge of the species through scientific analysis of the data we collect. Thank you all! Today marks the date when the first egg has been laid in both of the past two years, as can be seen in the table below, which also sets out incubation and fledging periods over the last few years for the St George’s pair. So an egg laid overnight or tomorrow would be right on cue. 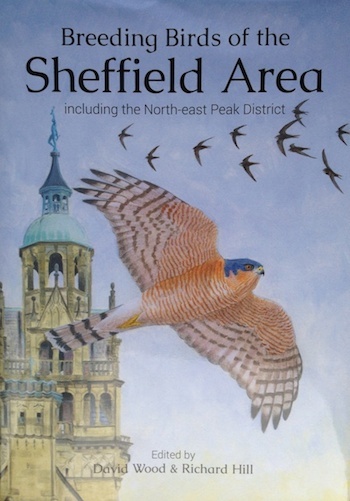 As the breeding season looks about to get under way again in earnest, judging from the female’s occupancy of the nestbox tonight, it’s also a chance to look back to see how things have changed for Peregrines in the Sheffield area over the last 50 years, although sadly the story of illegal persecution has not changed in some parts of the Peak District. It really is heartening to feel that we are watching a real change in the fortunes of this wonderful species in the UK, especially as they become increasingly established in urban settings such as St George’s. 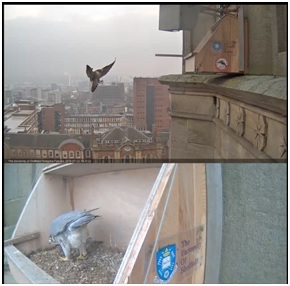 For those interested in such things, next month’s Sheffield Bird Study Group talk will be a treat, as it will bring Esther Kettle from Nottingham to talk about her PhD research into urban and rural Peregrines. For details see the SBSG website. Still no egg as I sign off, but I don’t think it will be long… Keep watching! And finally, if anyone would like to see the slides from the talk that Nicola Hemmings and I did as part of the Sheffield University Festival of the Mind back in September, from which the two tables above are taken, you should be able to look through them from the link below.